The number of meningitis vaccines administered reached 100 million in Nigeria, part of Africa's "meningitis belt." 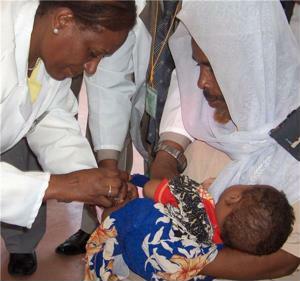 Following the launch of MenAfriVac , nine other countries now follow Africa's lead in hosting vaccination campaigns to protect citizens against meningitis.Seasonal meningitis A puts 450 million people living in the meningitis belt at risk, including residents of 26 countries. The largest epidemic in Africa's history came in the season between 1996 and 1997, when 250,000 were infected and 25,000 died. "When we began developing this vaccine, we knew how desperately it was needed, and we hoped it would quickly provide relief for the many people who dread sub-Saharan Africa's meningitis season," said Steve Davis, president and CEO of PATH, a partner in the creation of MenAfriVac . "We are so proud to see African countries quickly embrace this vaccine and to see that deadly and debilitating meningitis cases have virtually disappeared in the regions that have been vaccinated." Effects of the meningitis disease include painful inflammation of brain lining and the spine which can cause death in 24 to 48 hours. GAVI Alliance CEO Seth Berkley said meningitis affects young people, and even when a case isn't fatal, it can result in severe neurological damage, learning disabilities, deafness or amputated limbs. "It is nothing short of remarkable that exactly two years after the first GAVI-funded meningitis vaccination campaign in the meningitis belt, the 100 millionth will have their life protected," Berkley said. MenAfriVac has gained approval to be kept outside the cold chain for up to four days. However, during such a time, the vaccine must be kept below approximately 100 degrees Fahrenheit in a controlled temperature chain. Due to sub-Saharan Africa's various climate zones, keeping the vaccine at an optimum temperature can sometimes be challenging. The Centers for Disease Control and Prevention stated that normally, vaccines must be kept between 35 and 46 degrees Fahrenheit, making MenAfriVac the first vaccine of its kind as far as vaccine temperature monitoring goes. Vaccine temperatures must be kept within the recommended ranges to prevent reduced potency and protection, according to the CDC. "Cool is the rule for a successful vaccine program, and it starts with proper storage and handling," said industry expert Greg Edwards. The CDC advised a proper cold chain incorporate all equipment and procedures, include vaccine temperature monitors, for precise storage and vaccine handling along every step of transport.